A new community collaboration is responding to Virginia’s high rates of sending youth to the juvenile justice system. Calling the trends a “crisis,” the project combines art, education and legal advocacy to push for reform. Catherine Komp has more for Virginia Currents. Learn more: Find out more about Performing Statistics and the people and groups involved in the project, and follow updates on Facebook. Find resources from Legal Aid Justice Center. Read the investigation by the Center for Public Integrity and Reveal. More than 10,000 Virginia youth were put in juvenile detention in 2014, according to state figures. The average rate of suspensions or expulsions in the 2011-2012 academic year was about 1,000 per school day; more than half were for things like defiance, disrupting the classroom, obscene language and disrespect. Jeree Thomas: Discipline is supposed to mean teaching but it has become a lot more about punishment. Jeree Thomas is a lawyer with Legal Aid Justice Center. Thomas: Instead of teaching young people, we exclude them, we exclude them from school or we isolate them, we put them in incarceration or other environments where they’re invisible and when you think about it that’s the exact opposite of what we want to do because want to create successful, contributing citizens. Thomas and other legal advocates have joined forces with artists, educators and activists in a collaborative project called Performing Statistics. The initiative aims to raise awareness about the “school to prison pipeline” or the policies and practices that push youth into the criminal justice system. Mark Strandquist: These issues are so systemic and impacting so many of us. Mark Strandquist is director of Performing Statistics, which builds on a collaborative photography initiative he launched in 2012 called Windows from Prison. That project asks inmates to write about a place or scene they wish they could see from their prison window. Their descriptions, which often include drawings and maps, are matched with community members who photograph the scene and send it back to them. Strandquist: While that project has been an amazing thing be part of and the US Embassy is sponsoring it in Ottawa and it’s happening all over the country, it’s more about using art to connect people on a human level. With Performing Statistics, we’re trying to take that the next step further and really connect people most impacted by these issues, in this case incarcerated youth, with an amazing group of artists, designers, activists, the leading policy advocates in the state to really work together to create a tourable, mobile exhibition that can connect people across the state around these urgent and critical issues. Planning for Performing Statistics began in 2013 and activities started earlier this year, with educational and art projects for youth and incarcerated people. In June, a week-long exhibit and “learning exchange” took place at 1708 Gallery. 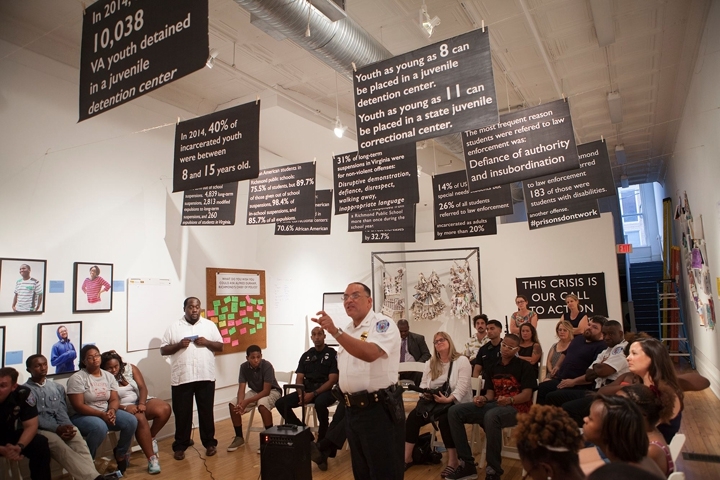 Through workshops, forums and panel discussions, artists, advocates, teachers, teens, policymakers and police came together to talk about alternatives. At a roundtable with Richmond Police Chief Alfred Durham and other officers, youth expressed concerns about being profiled and the role of School Resource Officers or SROs in the number of students entering the justice system. Youth Question: What are three things you would change to help reduce the number of youth that are referred to the system through school offenses? The Chief said he’s already studying these issues and meeting with SROs and school officials to evaluate policing in schools. And this wasn’t just a discussion. Plans started being made. The Chief asked to sit at the table this summer when Art 180 and youth in juvenile detention develop a training manual for officers. And he sought teens’ advice on how the department could communicate better with young people. Antoine Ford: What I really wanted to ask the Chief, just a personal question, was what did justice mean to him? John Marshall High School freshman Antoine Ford is part of Art 180 and the Performing Statistics project. Ford: Not as an officer, but as a normal civilian. You don’t always wear your title. You get in your shower, you’re not thinking about being Chief of Police, you’re thinking about your wife and your children and the people who you care about and if something happened to them, what would justice mean to you. If someone randomly shot your son, how would you deal with it? You can’t just see from a cop’s point of view, you have to see from a human’s and civilian’s point of view as well. Another Performing Statistics contributor is Savannah Peters, a freshman at Open High School. Savannah Peters: I think something that encouraged me last night was how he was still trying to reach out to teens. "We can have a meeting, here’s my card;" he wants to do better and that made me feel better. Earlier this Spring, Peters, Ford and other teens from Art 180’s leadership program spent three weeks with Thomas from Legal Aid Center Justice Center learning about the school to prison pipeline. With the help local artists and educators, they then created characters whose stories were presented on human scale models of a pipeline. During the learning exchange, teens took small groups through each character’s story and the pathways that led either to the criminal justice system or a more positive future. Audio recording: TJ tries to explain that though he doesn’t have a note, he has permission to paint the mural. But the SROs don’t care about his explanation. They handcuff him and tell him he’s being arrested for trespassing and destruction of property. As teen facilitators play audio recordings of the story, they encouraged the group to come up with alternatives that would have helped each character avoid expulsion or arrest. Through this exercise, participants find that along the pipeline, all individuals could have done something to lead to a better outcome, from the students to the teachers to the SROs. Peters: I think it taught me that there’s always a choice to how you want your life to end and whether you think it or not, there’s always something you can do to make your life better. You choose how you want your life to end. I hope it teaches this is a really serious matter, something that needs to be dealt with, it’s not a game, it’s some serious stuff. Ford: It taught me the difference between wrong and right choices. It really improved my awareness of what can possibly happen when you do the bad things, make wrong choices in life and where it can lead you. What it really taught me is your determination for any type of goal that you want to do. Whenever you set a goal, it’s more of your drive to get there and if you lose that drive at any moment you can possibly fall down the wrong path. Ford and other teens will be working with youth from the Richmond Juvenile Justice Center this summer. Three days a week, the youth will leave the Center and travel to Art 180 for an eight week long camp. Working with Strandquist and other artists, they’ll be developing screen prints, photography, audio pieces and the police training manual. The work they create will be added to a larger exhibit that will be displayed in Richmond in September and tour around the state. Art 180’s Trey Hartt says this intersection of art and legal advocacy can impact change on multiple levels. Trey Hartt: The ability to express oneself creatively I think is a vital human need and when we cut that off through these systems like testing or law enforcement or very strict, rigid structures, we’re losing our sense of humanity. So what art does it brings that out in people and allows them to tap into who they are and what they want in the world and build creatively a future for themselves. When that art is shared with the public, says Hartt, it’s easier to digest the complex and difficult issues surrounding criminal justice. Hartt: So I guess there’s two things. There’s supporting the human that’s behind creating the art and supporting the community’s ability to see them as another human or hear these statistics or understand or imagine a different future for themselves and art is just so critical to that. Earlier this year, Virginia made national news when the Center for Public Integrity and the radio show Reveal published an investigation into students entering the criminal justice system. Analyzing federal data, researchers found the rate of students referred to law enforcement was 16 per 1000, nearly three times the national average. Black students and those with disabilities made up a disproportionate number of those affected. In response, the Governor’s office directed cabinet officials to examine the root causes of the problem and issue policy recommendations. Thomas: I really hope people act on this issue because it is one that impacts everyone. Advocates like Legal Aid Justice Center’s Jeree Thomas would like to see schools’ zero tolerance policies re-examined and more programs that emphasize restorative justice and positive behavior support systems. Thomas: When you look at the fact that we spend, in 2014 we spent over $150,000 incarcerating one kid in a juvenile correctional center for one year. That’s taxpayer money that's going towards incarcerating a kid who’s not necessarily getting the services and treatment they need in that space. So spending money on programs that don’t work, that impacts everyone. It has economic and social costs, it has public safety costs. As a community, we should be focusing on how can we provide treatment and services to our fellow citizens in a way that will keep all of us safe and healthy and contributing members of society. All Performing Statistics photos courtesy of Mark Strandquist. Portraits of Peters and Ford by Mitra Bryant. Thanks to film collective Good Day RVA for sound from the police roundtable discussion.